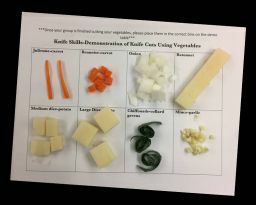 This hands-on lesson plan, shared by Marlee Barton of Kentucky, includes knife skill activities using Play- doh and graduating to real vegetables. A soup lab follows. Sounds like a fun and delicious way to learn about knives! Students learn to properly hold a knife. Students learn to carry a knife safely. Students learn to identify several types of knife cuts. Students learn to make the correct knife cuts using Play-doh and vegetables. The first day students research various knives (see infographic below). Students are to identify them and then tell what their functions are. Then, we go over them. Then, I intro knife skills. Using a knife I show them how to hold it correctly and identify the different parts of the knife as I go along. The next day I demonstrate the different knife cuts, how to hold the knife, how to cut properly, how to hand a knife over to someone else, etc. As I do each cut, the kids are standing at the prep tables (cutting board and knife per person). They do the cuts as I do them with the Play-doh. They shape the Play-doh into the vegetable I am cutting and they cut it the way that I do. The following day, students demonstrate the knife cuts using actual vegetables. Students wrap up their knife practicing by using the vegetables they cut to complete a soup lab. Thanks for you sharing your lesson/lab with us! Knife skills are very important for kitchen safety and also make the experience of cooking that much more enjoyable.